The biggest headlines from this past week came out of the Big Ten, where a couple of top 10 matches occurred with an upset here or there as well. Of course, the Big Ten and Pac-12 always create shifting in the rankings with so many matchups, which led to the biggest ranking differences this week. The Cougars had maybe their biggest hurdle remaining in the regular season, but won at San Diego in four sets to remain unbeaten. A pair of road tests come this week though as they got some extra time off to prepare. Stanford kept things humming on the road against a solid Utah team and then in sweeping Colorado to remain unbeaten in the Pac-12. The two Washington schools come to town this week. The Golden Gophers have a big leg up on everyone else in the Big Ten now that they’re not just undefeated, but also have a win in Lincoln. They now have to hold serve at home with four in a row, including vs. Illinois this week and Nebraska next. Nebraska is still in the running for a Big Ten title even after a home loss to Minnesota, but what happens in that regard will likely be defined by the next three weeks. They’ve got at Penn State this week, then road contests against Wisconsin, Minnesota and Ohio State before a home meeting with Illinois. The Badgers did lose, but it was a five set upset at Iowa after downing a top 10 road team. They’ve got the same amount of losses as the team below them now with a similar resume and the head-to-head victory, so they stick at number five although the gap has been narrowed. Texas struggled in a road match with TCU, but pulled things out after winning the last five points in the fifth. This week will feature two road contests over scrappy opponents, and Kansas has emerged as possibly Texas’ top contender, so the meeting in Lawrence will once again be huge. Illinois couldn’t handle Wisconsin, but is still 5-2 against VolleyMob ranked opponents this season at the time of play. So they’re definitely good, but what will define if they can be great could be this week as they get a couple of more chances for a top 10 victory over an upper echelon conference team. The Panthers continue to rack up wins, and have still only been pushed to five sets once this season. A three match week is ahead this week, including two road matches against solid teams that won’t be cake-walks. The Gators almost suffered a home upset, but at the end of the day a conference win is just that, a win. They had a similar story with an even stronger Georgia team, but they keep winning as they stay on top the SEC standings. The Bluejays kept the winning coming in the Big East with a sweep of Seton Hall and a good St. John’s bunch. They’ve lost just two whole sets so far playing in the Big East and now inch into the top 10. The Nittany Lions have now won four straight, including getting some revenge on Ohio State with Nia Reed back in the lineup. A huge week is now ahead for Penn State if they want to keep the momentum going forward. The Trojans started the week with a sweep of Oregon State, but then had a bad home sweep loss to Oregon. It’s a talented Ducks squad, and showed that maybe there isn’t too much separation for second place among several teams in the Pac-12. The Mustangs biggest contender for their league crown is Hawaii, but they handled them at home to garner the early edge. A trip to Hawaii will come later, but as for now the Mustangs keep the good times rolling. Michigan earned two more victories, one in an impressive sweep over a ranked Purdue bunch and another in squeaking things out against a feisty Hoosiers squad. They now embark on four straight on the road. 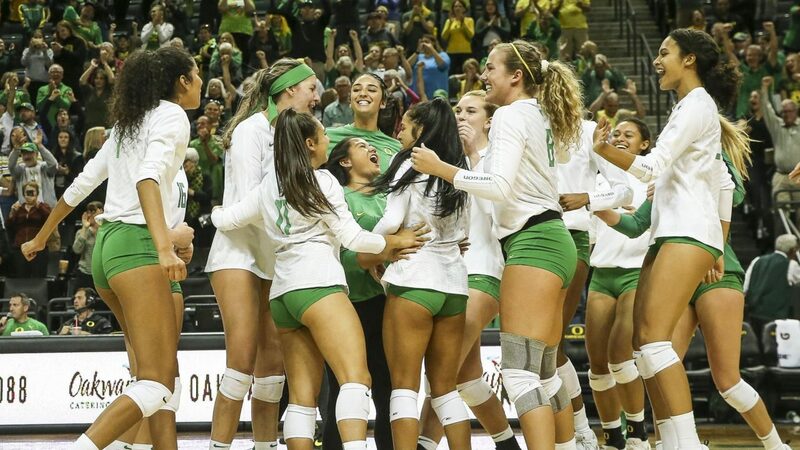 After a rough 0-2 week against the Arizona schools at home, Oregon got back on the right track with a road sweep against UCLA and then an even better 3-0 win at USC. They’ve been a bit up and down, but when they get things going they are really tough. It will be interesting to see which version shows up in the mountains. One of Arizona’s top hitters was out, but knowing that Washington did exactly what they should have and more in getting a road sweep. They couldn’t follow it up though and were swept by Arizona State, as they fall into the large pack of 4-2 teams in the league. Two more sweeps for Marquette gives them four wins in a row – and a total of 12 straight sets. The rematch with Creighton comes later in October, but they’re doing a good job of just focusing on the now, although they’re still sitting on just one ranked win. The Cougars collected a third straight victory with a sweep at ASU and then eeked one out on the road with Arizona for a perfect weekend. They’re now in the group of 4-2 teams battling for second in the league behind Stanford, who they play this week. The Wildcats had a lone match week and have now won 10 of 11 matches. A meeting with Tennessee will be a tough one for Kentucky, as they look to keep moving things forward and are still looking for their first ranked victory while others are earning them. The Buffaloes four Pac-12 losses are all explainable: two on the road against ranked opponents and two at home against the perceived top pair of teams in the league. Their win over Iowa looks better now too, after the Hawkeyes upended Wisconsin. Iowa took a set off of Nebraska on the road and then got their crown-jewel of a victory in upsetting Wisconsin in five sets. Tough matches keep coming in the Big Ten, but a big one for the middle-pack teams occurs between them and Purdue this week. The Wildcats couldn’t follow up their big week against the Oregon schools and didn’t fare as well with the ones from Washington. Still, they were without a starting outside hitter, so the losses are excusable. The schedule does them no favors this week. UCLA has racked up all of their Pac-12 wins against unranked teams, and are 0-9 in sets against the ranked ones. A chance to fix that comes this week against Arizona. After winning the first set on the road against Kansas, it was all downhill for the Bears as they’ve already suffered three league losses. They’ve got to start turning things around before its too late if they want any chance at hosting in the NCAA Tournament. The Boilermakers were swept by Michigan on the road but did bounce back in a win at Michigan State to stay on the edge of the VolleyMob Top 25, with a ‘show-me’ week ahead.